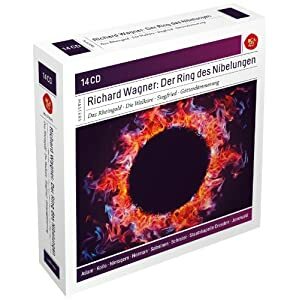 It's hard to argue with a Ring cycle for $31.99! The Janowski Ring, the first digitally recorded cycle is currently available for well under $2.50 per disc at ArchivMusik (with no program notes or other frills). I don't think that this will be many people's go-to Ring cycle, but it is certainly a rewarding set of performances with some wonderful moments and fine conducting from Marek Janowski. Some reviewers have taken issue with Jeanine Altmeyer's Brunnhilde, and it is true that she lacks the intensity and psychological depth of Martha Mödl or Astrid Varnay. But she certainly sings with passion and is a fine partner to Rene Kollo's Siegfried in their great duets. Theo Adam is a compelling Wotan/Wanderer, but the real highlight for me was the pairing of Siegfried Jerusalem and Jessye Norman as the ill-fated Walsung twins. Marek Janowski is as underrated in Wagner as he is in Bruckner. But fortunately Pentatone have faith in him and are planning to release concert recordings of all 10 Wagner operas with the Berlin Radio Symphony. Enthusiasts will want to listen to this cycle, now nearly 30 years old, as we wait for his new version of the Ring. The concerts will take place in the coming season. Hopefully they will be released not long afterwards.